Requirements, rules & regulations: International Safety Management Code (ISM) specifies the rules and regulations for maintenance management that influence the shipping industry. The ISM Code stipulates that each ship operator is responsible for the safe and pollution free operation of the ship and that the ship’s hull, machinery and equipment should be maintained and operated in accordance with applicable rules and regulations. The part of the ISM Code on “maintenance of the ship and its equipment” describes in general how ships should be maintained, inspected, non-conformities be reported and corrective actions are taken. Accordingly, the ISM Code states that the shipping company should establish procedures to ensure that the ship is maintained in conformity with the provisions of the relevant rules and regulations and with any additional requirements which may be established by the company. Based on ISM Code, it is a requirement that “the company should identify equipment and technical systems that through sudden operational failure might result in hazardous situations”. When implementing a maintenance management system on-board a vessel as part of the shipping company’s safety management system, it is imperative to define the critical systems and equipment. Maintenance instructions according to manufacturers or other policies should be issued to ensure the uninterrupted and safe operation of them at all times. On the same issue of ship safety, the classification societies are a big player within their classification rules. The major classification societies gradually support more advanced routines for non-intrusive inspections such as condition-based maintenance where equipment and machinery systems can receive a specific class certificate of alternative survey arrangement, if maintained according this alternative method. This approach simplifies classification routines for certain specific ship-board equipment and systems and thus leads to more flexible operation and reduced inspection costs. Like any other continuous improvement activity, the senior management has to be committed to provide required resources, competent crew and a well designed and implemented maintenance management system in order to achieve the above objectives on-board. The fundamental part of the maintenance management system is normally a database that contains a register of all equipment on-board that need to be maintained. This database then populated with maintenance plans, maintenance activities carried out, etc. thus providing not only the requirements and plans for maintenance but also the fully history of maintenance activities performed. Effective maintenance planning is essential for ship operation due to its complexity and the obligations on shipping organisations to comply with certain regulations and requirements including ISM. Poor maintenance management could reduce the ship‘s availability, which may in turn, be reflected in the revenue of the company. Another issue that requires attention is the impact of maintenance on ship’s fuel consumption that is highlighted in this section. It is argued and shown that good maintenance leads more energy efficient ship operation, thus the requirement for maintenance and energy efficient operation fully overlaps with each other. Maintenance has different forms and its practice may vary from one company to other depending on their different requirements. The shipping company usually chooses the most appropriate maintenance type for various ship’s equipment based on its maintenance policy or strategy. Figure 8.1 indicates different maintenance types and policy options with an outline description that follows. Unplanned Maintenance: This type of maintenance is basic and simple as it is defined as breakdown maintenance. In this maintenance policy, the repair or replacement is performed only when failure occurs. In this type of maintenance policy, however, basic preventive maintenance routines such as lubrication and machine adjustment are applied to the system at regular intervals. Planned Maintenance: Maintenance scheduling or planning embraces all activities necessary to plan, control, and record all maintenance activities. Planned maintenance is based on a defined schedule of equipment maintenance. This maintenance policy is normal practice today in the majority of shipping companies. The planned maintenance schedule is decided based on manufacturers’ recommendation or use of analytical techniques such as analysis of mean time between failures (MTBF) and reliability analysis. This approach is based on a model of the time that elapses between maintenance periods that takes into account the mechanisms of failures. Therefore, planned maintenance schedule is not necessarily based on fixed-time schedules but could be based on an analysis method that takes into account a number of factors such as reliability characteristics of the equipment. Preventive Maintenance: This is a subset of planned maintenance (see Figure 8.1). Preventive maintenance usually depends on the manufacturer‘s recommendations and past experience for scheduling repair or replacement time. In this policy, the maintenance is performed on a planned basis within normally fixed scheduled intervals. Preventive maintenance is thus time-driven in that maintenance is performed based on elapsed time or hours of operation. The preventive planned maintenance is still the main strategy for shipboard maintenance. The intervals were based upon the manufacturers’ recommendations in addition to past company’s or ship-board experience. Predictive Maintenance: This is a subset of planned maintenance (see Figure 8.1). This is generally based on what is referred to as condition-based maintenance (CBM) or reliability-based maintenance (RCM). The maintenance decision is based on the current condition or reliability of the system or equipment. This policy stipulates the monitoring of the machinery and acting upon its condition. Usually, engineers record the system parameters, do condition/performance analysis and use their senses or equipment to hear, sight, and smell the equipment in order to assess the condition of the system. Different techniques are used in condition monitoring, such as visual inspection, performance monitoring, trend monitoring, vibration monitoring, lubricant monitoring, thermograph monitoring, and acoustic monitoring. The advantages of such a policy are that unnecessary maintenance work can be avoided. In this way, the loss of production during scheduled machine downtime can be reduced and components can remain in service if the machine is in good working condition. The industry is gradually moving from preventive maintenance to predictive maintenance. 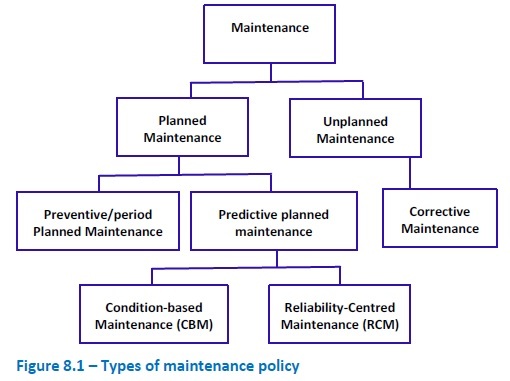 Reliability Centred Maintenance (RCM): This could be regarded as a subset of predictive maintenance. RCM is a structured way to determine the maintenance requirements of complex systems and assets. It was first developed in the late 1960s, and the approach was derived from the aircraft industry. RCM focuses on the effect of failure with the consequences of a failure being more important than its technical characteristics. The main objective of RCM is to reduce the maintenance costs by focusing on the most important functions of the system and avoiding or removing maintenance actions that are not strictly necessary. Corrective maintenance: The corrective maintenance may be defined as maintenance which is carried out after failure detection. Corrective maintenance can be subdivided into "immediate corrective maintenance" (in which work starts immediately after a failure) and "deferred corrective maintenance" (in which work is delayed in conformance to a given set of maintenance rules). Corrective maintenance is thus a subset of the unplanned maintenance policy. The ship maintenance and repair activities can be completed in two different ways. They can be undertaken in the ship repair yard when the ship is due for dry docking for regulatory or class surveys. 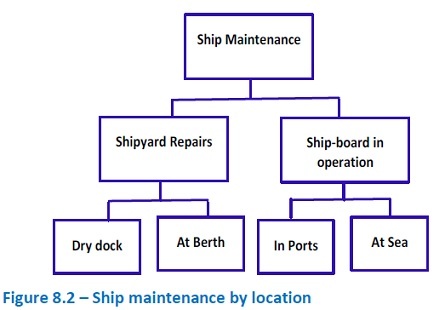 Certain type of maintenance activities are carried out at shipyard when the ship is at berth. Maintenance can be conducted during the ship‘s day-to-day operations of the ship; either while at sea or when in port. Figure 8.2 shows this way of dividing the maintenance and repair activities. Any overboard maintenance must be carried out only after taking permission from port authorities and taking due precautions to prevent any material falling overboard. Many port authorities have pollution regulations that restrict or forbid maintenance being carried out over the ship’s side. This is due to the possibility of potentially damaging substances dropping into the water. Accordingly, Masters must check with the local agent to see what regulations are applicable before planning or carrying out any overboard maintenance. In ports where such maintenance is permitted, all possible precautions are to be taken to avoid polluting the water with paint, thinners, chemical cleaners, loose scale or other possible contaminants. Maintenance operations are fundamental for energy efficient operation of machineries and systems. Deterioration of ship systems’ condition takes place due to normal wear and tear, fouling, mis-adjustments, long periods of operation outside design envelopes, etc. As a result, equipment downtime, quality problems, energy losses, safety hazards or environmental pollution may results. The end result is a negative impact on the operating cost, profitability, customer satisfaction and probable environmental impacts if maintenance is not properly done. The major challenge of maintenance optimization is to implement a maintenance policy which maximizes availability and efficiency of the equipment, controls the rate of equipment deterioration, ensures the safe and environmentally friendly operation and minimizes the total cost of the operation which includes energy cost. Fortunately, most of the machinery maintenance activities are simple adjustments, cleaning, part replacement, or elimination of adverse conditions which means preventive maintenance. Studies by a variety of industries and companies have shown that a company can cut energy consumption at its facility by about 5% to 10% by focusing on its preventive maintenance effort [Terry Wireman 2011]. As indicated earlier, the main strategic aim of a maintenance programme is to safeguard the safety of ship and its assets and increase the ship’s availability for highest operational returns. Luckily, the good maintenance of a ship generally leads to improved performance of the hull, propeller and machinery, thus provides a more energy efficient operation as well. The impact of hull or propeller fouling and roughness on may affect ship energy efficiency quite significantly. Thus keeping hull and propeller in clean good condition can lead to major energy saving. Engines are the subject of frequent maintenance actions for a variety of reasons; one of the main reason being the impact of burning low quality fuel and its impact on engines. Engine condition monitoring is normal practice on-board ship and engine adjustments and tuning could lead to energy saving. On board ships, a variety of mechanical transmissions systems are used. The most complex and important one is the propulsion shafting and the simpler ones include all the mechanical linkages between drives / motors and the machinery. The energy savings in mechanical transmission systems would be influenced by the type of maintenance performed and adjustments made. Shaft and couplings alignment: Any shaft misalignment will not be good for machinery maintenance as well as for transmission energy efficiency. This would lead to extra losses in the system in the form of heat. V-belt slippage: Improved tension in belt-driven transmissions would prevent slippage during loading on the belt as well as during high loading. This would reduce frictional losses due to slippage. Chain and gear misalignment: In chain-driven systems, any misalignment will lead to loss of energy and at the same time will not be good for upkeep and maintenance of the system. Proper bearing lubrication: Over-lubrication and under-lubrication are not good for energy efficiency. If bearings have excessive lubrication, it may need to churn more of the lubricant, increasing the fluid friction in the lubricant and thus energy losses. The opposite is definitely not desirable as the lack of enough lubrication not only will increase energy use but also will lead more maintenance due to extra wear and tear due to metal to metal contact. Similar to mechanical systems, the energy losses in electrical systems can also be influenced by state of maintenance of the system. Typical energy losses occur in poor operating conditions for electric motors. For example, when a motor is fouled with dirt and moisture, this would inhibit the thermal heat transfer process. This condition results in increased resistance of the wiring which further increases the temperature of the motor and subsequently its energy consumption. This could lead also to early failures as compared to a better maintained electric motor. For electric motors, improper or insufficient maintenance on mechanical transmission system (as explained above) will also increase the amount of energy required by the motor to drive the system. Reduced fouling of boilers with direct improvement in its energy efficiency. Adjustment of combustion air in relation to fuel flow in boilers (so called control of excess air). This is part of the performance-related maintenance activities that could yield significant energy saving. Leak detection programs for hot water and steam. All leak reductions directly will support the energy efficiency aspects as well. Insulation inspection programmes to reduce heat losses from the system due to loss of insulation. End-use steam optimisation via improved cleaning of the heat transfer surfaces, etc. All the above measures can be only achieved by an effective maintenance programme. Compressors: Poor maintenance of compressors or incorrect pressure settings would lead to extra running hours and thus more energy use. Air leaks: Any air leakage in the system would require the compressors to run more than necessary. This would lead to additional energy use by the need for compressors to operate for longer periods. End use devices maintenance: The compressed air is used for end-use devices that may have a poor state of maintained. This will lead to extra need for compressed air generation. The above examples are part of a longer list where proper maintenance could support energy efficiency. All of the above require planned or condition-based approaches to maintenance of the compressed air system. 1. Darabnia B and Demichela M, 2013 “Maintenance an Opportunity for Energy Saving” Chemical Engineering Transactions, Vol. 32, 2013. 3. Gösta B. Algelin 2010, “Maritime Management Systems - A survey of maritime management systems and utilisation of maintenance strategies”, Department of Shipping and Marine Technology, Chalmers University Of Technology, Gothenburg, Sweden, 2010. 4. Yousef Alhouli 2011 “Development of Ship Maintenance Performance Measurement Framework to Assess the Decision Making Process to Optimise in Ship Maintenance Planning” PhD Thesis, School of Mechanical, Aerospace and Civil Engineering, University of Manchester, 2011.